Our beloved JRT Bo crossed the rainbow bridge after 16 years. Our family was consumed with grief, and we decided we would wait awhile before getting a new dog. 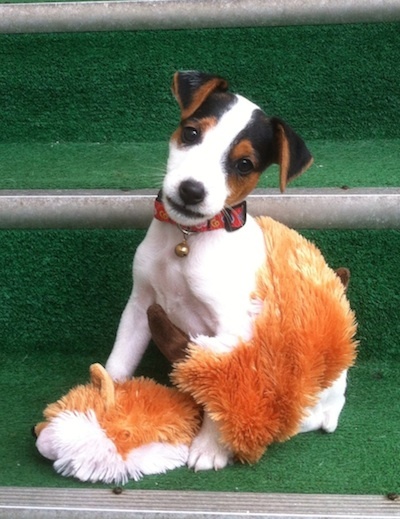 The breeder Salishan Jack Russell Terriers had a litter of 5 puppies. We went to just check out the puppies, and when the barn door opens a “jumbo” jack runs towards us and that was it. Lou chose us. The breeder warned us before we left with our 3 pound Lou. 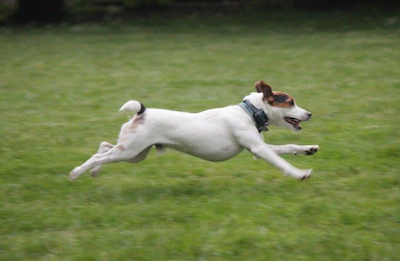 Give him consistent training lots of exercise and socialization otherwise a JRT will run your life. Since we were a bit rusty with basic dog training we listed our wants for our Lou. We came across Sit Happens that seemed to fit our needs and scheduled a consultation. We were amazed at how well behaved and attentive Diego and Flirt were during the demonstration. During one of our in home sessions Jeff showed us how to handle Lou’s ears, eyes, paws and teeth regularly. Lou allows us to clip his nails without two of us holding him down. This is Lou’s calm down and bonding ritual before going to sleep for the night. OK we are lying there is no such thing as a calm JRT! Lou enjoys having his teeth brushed with minty dog toothpaste (doesn’t like the meaty flavors). The vet commented on his very large pearly white clean teeth. We live in an apartment on the North Shore where we have wide open fields and trails as our backyard. There are dogs everywhere not to mention wildlife too. We wanted Lou to enjoy the freedom of running off leash or stay by our sides to keep him safe or playing with his four legged friends. Anytime we have questions or concerns the Sit happens team is there for us. The training is good for the lifetime of the dog. We drop in every once in a while in case Lou forgets his manners. Thank you, Sit Happens team. They love our dogs like their own dogs and it shows.